It is a different world here. Arriving at midnight, I walked out of the arrivals hall (well, that’s a stretch – really just a room with a luggage track, exiting directly into the parking lot) and found my pre-arranged taxi driver holding a hand-printed sign “EURO Hotel.” So far, so good. We walked across the lot and ended up at a Lada older than I am, painted yellow & black in traditional taxi colors. The door handles on the passenger doors didn’t work from the outside and although there were seat belts installed (in the front only), they were dysfunctional. Despite all that, after only a few sputters and moans the engine caught and we were good to go – in a rickety way. Driving out of the airport lot, we saw about 7 different groups/pairs walking away from the airport. Also having arrived on the late flight from Moscow, they were apparently walking home, towing their luggage along with them. Thankfully, after a few tense moments of non-communication (both of us talking in our own language), I realize he wants the address of the hotel. The taxi was arranged by the hotel, so I find it a bit strange that he doesn’t know where it is, but I show him my reservation confirmation anyway. And with that, he pulls back into the street, apparently clear now on where to take me. Go figure. Two more turns and a few blocks later, we arrive. Only to be faced with the next issue – that I have no Rubles to pay (perhaps needless to say, there was not an ATM in the “arrivals hall” in Mineralnye Vody). Heavy multi-lingual negotiations with the help of google translate ensue, finally culminating in my hopeless over-payment (10€) to get rid of the guy and head to my room. Before which, I was presented a handwritten list in a notebook, to choose four items and write down my planned breakfast time. No general open hours, no menu, no buffet – a handwritten list in a spiral notebook. Yes, the world is different here. I woke up to a bright, sunny day, took my breakfast in the 1960’s style, funky restaurant, and then walked 5 blocks to the nearest Bancomat. I still can’t speak 2 words of Russian to save my life, but at least now I have local currency – and with money, you can get anything accomplished in this country! A relaxed morning of cutting tags out of clothing (less weight to take up the mountain), showering, improving my compression packing & then reading in the sun. Then back to the airport to meet my guides and group. At the airport café, I ordered a salad & grilled salmon, expecting a light lunch. Only to be served a salmon steak that was probably a quarter of the fish! It was HUGE. It was also wonderful – nicely spiced and grilled to perfection, falling apart flaky but still moist, slightly crisp on the outside. Mmmmmm. I was in heaven, right up until I was presented with the bill. Apparently the prices in the menu were not per portion, but per 100gr. Oh well, such salmon I can’t get in Germany for any price, and who knows what I’ll be eating in the coming days. Maybe it was a well-spent (albeit unbudgeted) splurge. Next on the agenda was a long drive packed side-by-side into an old, beat up van with no air-conditioning. It was long. And hot. And thankfully it’s now behind me. We just arrived in Terskol, surrounded by beautiful countryside. The fog is sitting on the foothills and it’s started raining. That’s good – maybe it will rain itself out and then clear up for tomorrow and acclimatization hike #1. Today was the first acclimatization hike. I was very tired this morning, and when I looked outside to see the constant, heavy rain, it did nothing to help my lethargy. After breakfast, we donned rain gear and headed up the mountain. I have rarely been so appreciative of good functional clothing! After a bit, I woke up and started feeling good despite the weather. 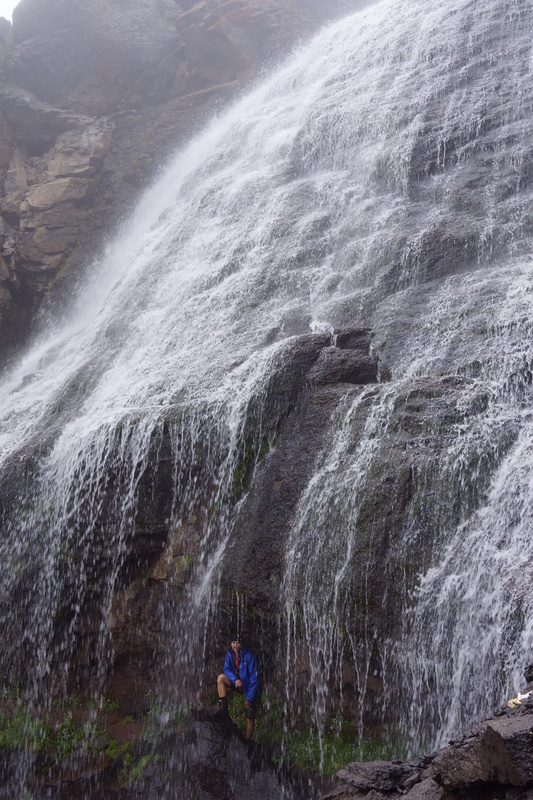 We stopped at a beautif ul waterfall called “braided hair” and not long after, we reached the snow line. Now, last night at the briefing, the guides were telling people that running shoes would be okay for today’s hike. My assumption was therefore: not much snow. Which until lunch time held true – a couple of cm but no big deal. My newly sprayed approach shoes did fine. After lunch was another story. 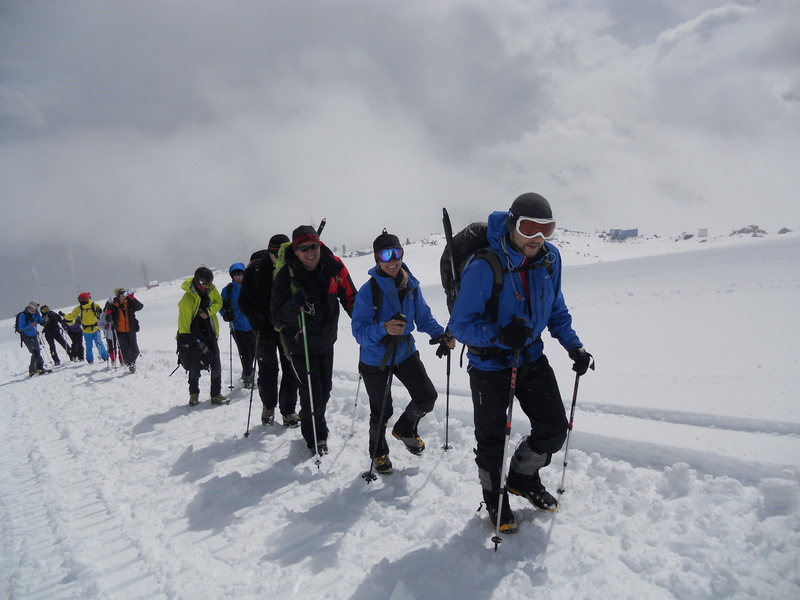 We continued up towards the peak, trudging through snow that steadily increased in depth. 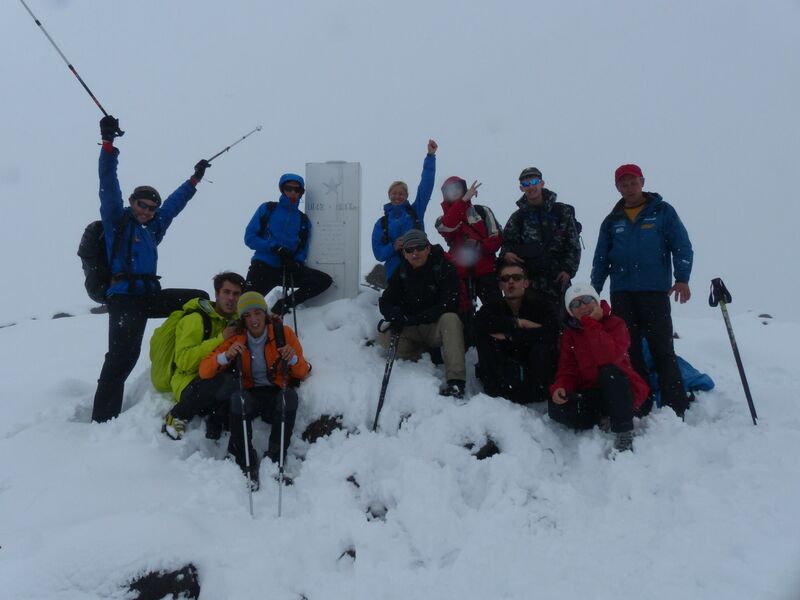 By the time we were at the top, there was about 30cm of snow! And after last night’s briefing, I didn’t bother bringing my shoe covers! By the end, I had wet feet and snow around my ankles, beginning to feel anything but happy. Luckily, it warmed up and even eventually stopped raining on the way down, and I walked with a very nice young man from the Ukraine, the pleasant conversation lifting my spirits again. Total for the day – about 1200m up (and back down), 7 hours on the road, and all things told: feeling good! Dinner was great today: cucumber & tomato salad, a hot, hearty soup (Russia is a soup country – they eat it pretty much with every meal), meat-filled cabbage rolls, and some bread that tastes like donuts but less sweet. Wonderful! I think I like Russian food. And now, packing my mountain gear into my backpack – tomorrow the real fun begins! I’m now sitting at about 3800m on Mt. 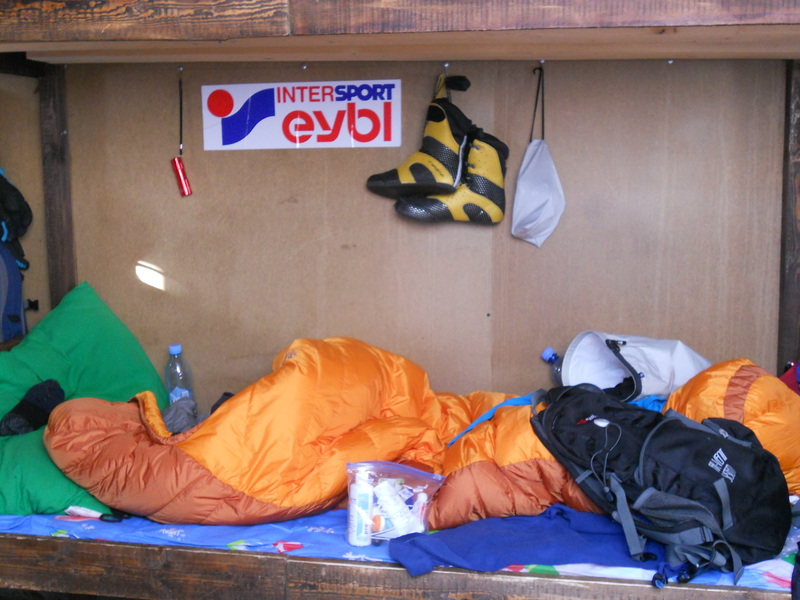 Elbrus, in a tin container filled with bunkbeds, 8 people & about 2 tons of mountaineering gear. I have to say, a 2-person tent might actually be preferable! The day was a bit slow: waiting at the hotel to leave, waiting at the cable car, waiting for an hour at the chair lift, etc. This is pretty much par for the course in Russia– I remember being astounded in Kamchatka as well, that everything involved waiting and that the term “5 minutes” can mean basically anything from 2 minutes to 2 hours. 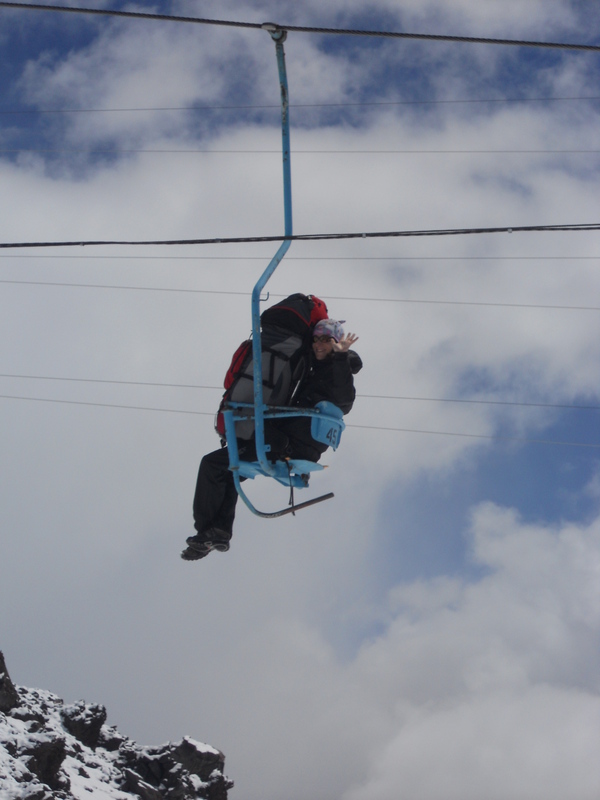 Perhaps the most exciting part of the day was the ride from the chair lift to the huts – we piled gear and people into the back of a snow cat. That thing just about goes vertical! I was sitting with my back to the cab, which means I was actually standing, feet braced against the floor and holding onto the bar behind me for dear life, to avoid falling right into the laps of my teammates on the downhill side. This afternoon we did a short acclimatization hike. I love traipsing through the snow with all my gear on. What a great sport! 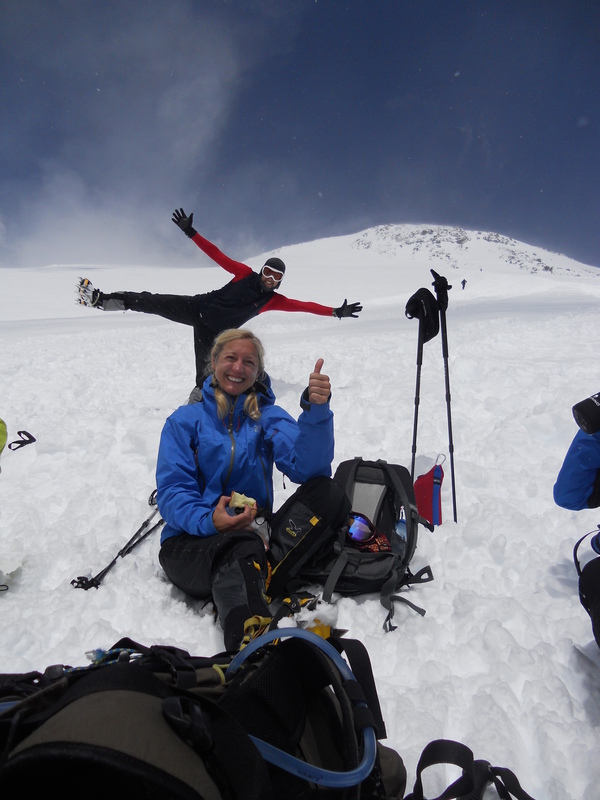 Panoramas of jagged mountains & enormous glaciers around us and Elbrus soaring above us – love it! I had a bit of a tantrum that we walked in a single file line of 17 people, which is not my idea of a reasonable expedition group size. But once I vented, it was okay again. Guess I just need to relax (not my strong point). Hopefully tomorrow, they’ll divide into two groups as promised; ideally a fast one and a slow one. Now we’ll see how the night goes, with adventurous journeys to the bathroom in the dark and this container full of people! Thank God that today is a rest day! The air is very dry, and combined with the sun & being sick yesterday (more about that later), I woke up with swollen lips and a dry, cracked-feeling face. It looks like a plastic surgeon visited in the night and injected silicone into my lips. But at least I feel better again, lip pain nothwithstanding. And the sun is shining, so I could enjoy the Caucusus panorama while waiting for the bathroom. Yesterday was a great day, right up until about 15:00. 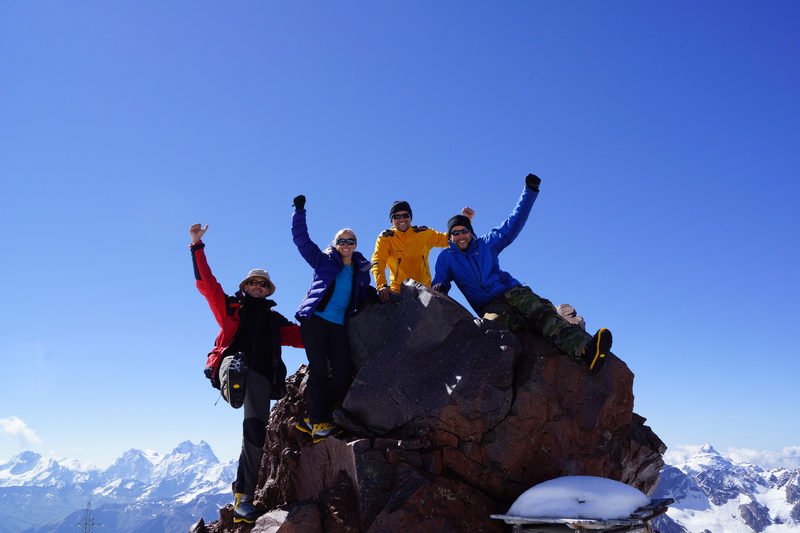 We had beautiful sunny weather, almost no wind, and did our acclimatization hike to 4700m. It was fantastic! Our guide Andrey let me trek my own pace, so I was free to move as I pleased and not stuck in a single-file line. It was HOT in the sun; amazing to be above 4000m in the snow and ice, and to sweat like a pig. 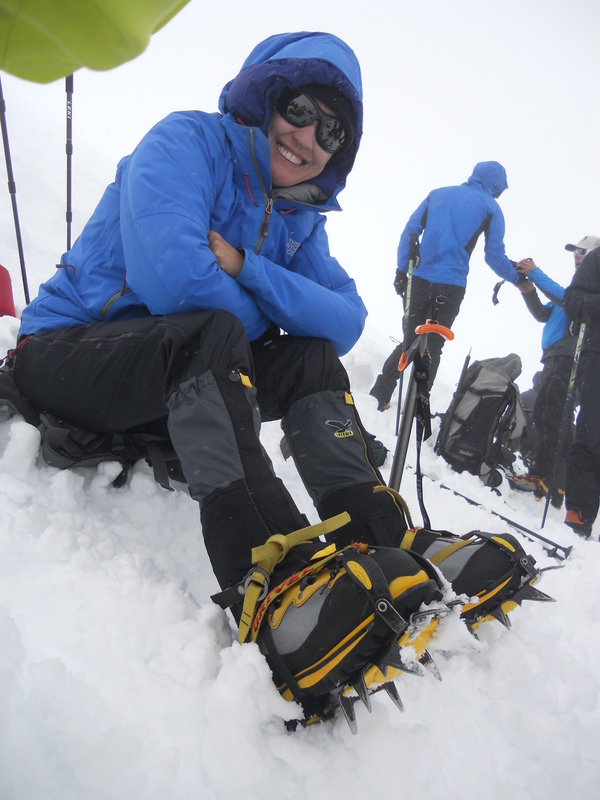 At 4300m we took a break and put on crampons, which we wore the rest of the way. 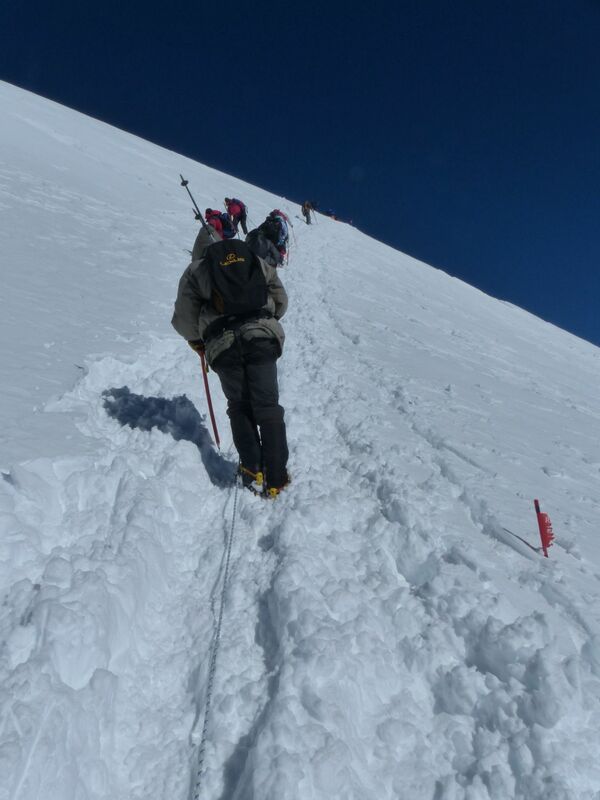 It got very steep, the air got thinner, and with every passing meter the crampons weighed more. I was shocked at exactly how strenuous it was, carrying the extra couple of kilos on my feet and kicking into the snow with every step. I loved it. We had snacks and hung out for about an hour just above 4700m, then made the long trek down. I had a nice conversation with one of the assistant guides, Vitaly, the whole way down. He is studying in Canada and has big dreams of someday owning his own heli-ski op eration over there – I told him to give me a call when he does. Arriving back at camp, we realized that no one in our (fast) group had the key to our hut – it was with someone in the slow group! Really bad planning. 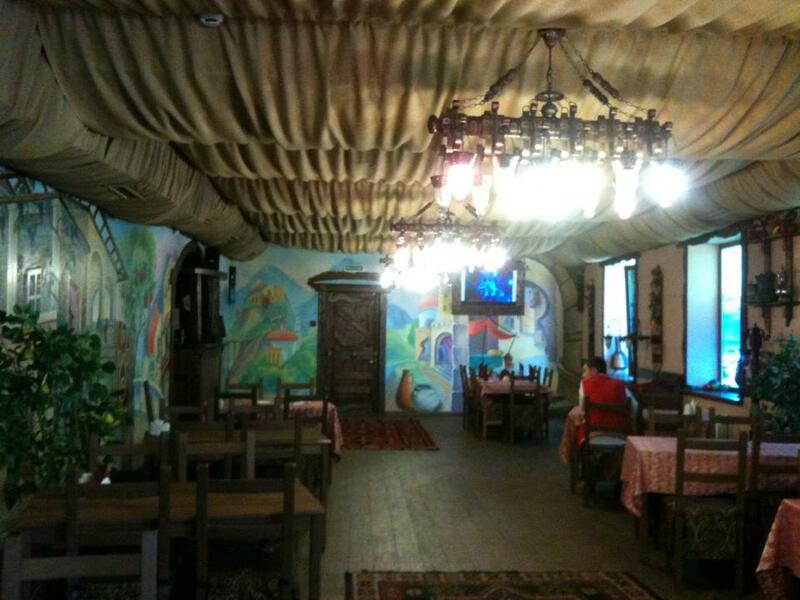 At 15:00 we had lunch (Borscht and some heavily mayonnaised salad) – although I was feeling a bit nauseous and not hungry. With every bite I seemed to feel even worse, and we still had a couple of hours to wait. To cut it short, I eventually found a nice spot to lay on a big rock, only to evacuate quickly and run to side, so that I could puke my guts out where no one would (hopefully) see. There went lunch, and anything that was left from snacks and breakfast. Disgusting. I felt a bit better and returned to my rock. Only to abandon it soon enough for a run to the toilet as diarrhea set in. I was so happy when the key finally returned and I could bury myself in my down sleeping bag! Which is where I stayed until this morning, except for the occasional jaunt to the bathroom. It’s all left me pretty dehydrated and low on energy today, but at least the sickness seems to be past. Now I just need to focus on rebuilding strength. In the afternoon, we practiced ice-axe arrests, climbing, and descents. All of which are quite energy-sapping! And then we had a crevasse rescue explanation and demonstration – as the guides proclaimed, “Just for our information, as we certainly won’t need to do one.” After dinner we had the summit briefing which included the news that today, not a single team made it to the top. 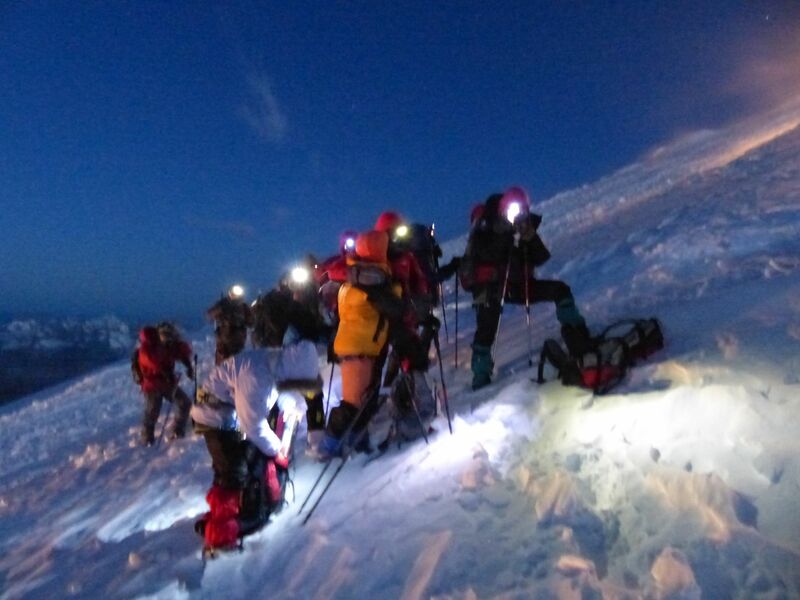 The combination of winds, avalanche risk and poor visibility forced them all back down. We’re hoping for better luck tomorrow. The trek started in part already last night, when we divided into groups based on who wanted to take the snow cat to 4700m, and who wanted (or needed) to take it to 5000m. A group of ten chose 4700m, and that became my summit team (we paid 50€ each, the other team a whopping 100€ per person for the longer ride). We went to bed at shortly before 9:00pm, alarm set for 1:30. I didn’t sleep a wink. And was so happy when 1:30 finally rolled around and we could get going. Breakfast at 2:00, then final gearing up with harnesses, crampons, etc, for the snow cat to pick us up at 3:00. I’m not sure when he finally actually got there, but it was late enough that we’d been standing around for a long time, and even with my 4-5 layers (including down jacket), I was cold. It was about a 30 minute drive up the slope, then we piled out, I snagged a crampon and fell face first but luckily no harm done. 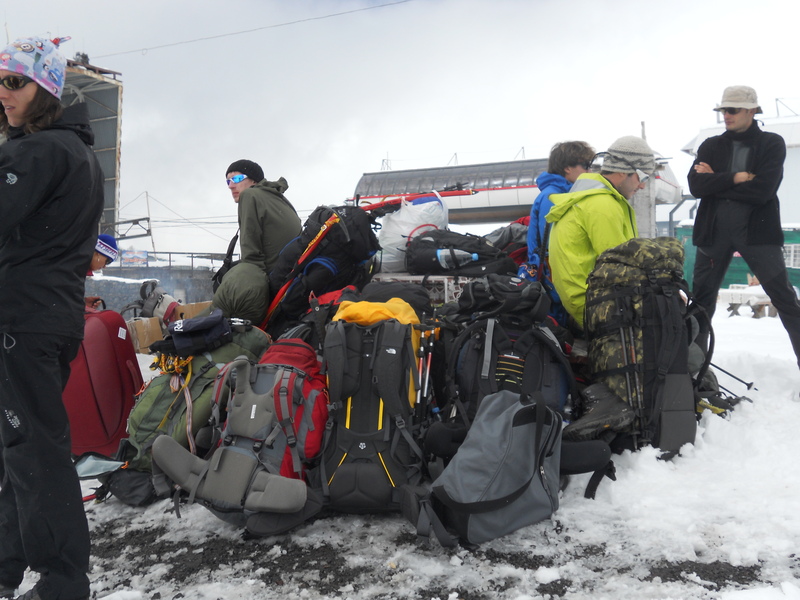 We collected our packs and headed off i In the icy, cold air with wind gusts up to 30kmh. Frigid!!! Even with my fancy double boots and down jacket, even trudging through the snow up an extremely steep slope, I was cold. And we plodded on. And on…. Eventually the sun came up, but we were in the shadow of the Eastern peak. 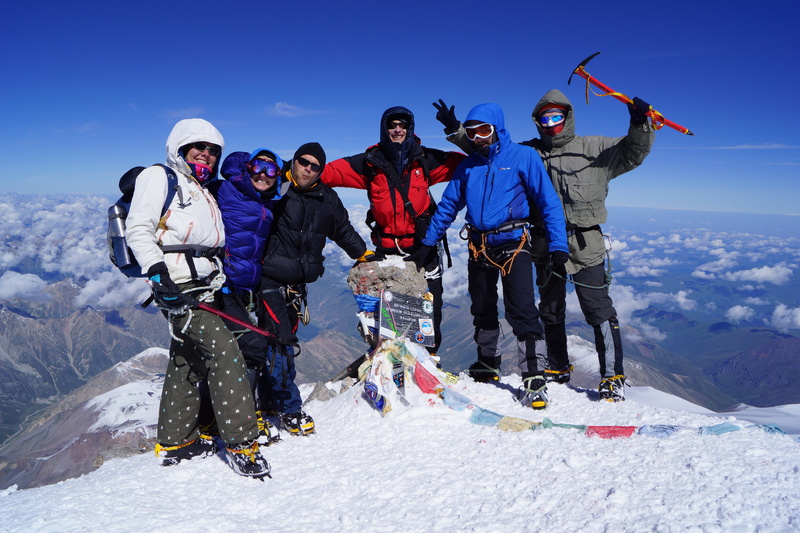 From our vantage point, we were able to see a spectacular site; looking west at the Caucasus panorama, we could see the gigantic, conical shadow of Elbrus’ western peak, reaching out across the sky and the surrounding mountains. It was such an amazing, beautiful and unusual site, that I found myself grinning despite my discomfort. At around 5200m, we were on a steep, slanting snow and ice slope, when I saw my left crampon had slipped off the toe of my boot. My teammate Martin, behind me, noticed too and pointed it out. I moved out of line, cursing my amateurness for not strapping it tight enough. At that moment, our assistant guide Natalia came to help, and discovered it had nothing to do with my technique – the metal track on the bottom of the crampon had come apart. She took it off to look at, while teammate Zhenya held me against the slope, so I wouldn’t slide away. I asked, “Is it broken?” and was more than dismayed when Natalia confirmed, “Yes, it’s broken.” Ummmm. And now? My summit bid looked over (many expletives) but even more importantly, how was I going to get safely back down the mountain? Panicked shouts, the group stopped, lead guide Vladimir came back to look. He first dug me a hole to sit in without sliding away, and got the team moving forward again. And then removed his gloves to try to fix the crampon. In -20° weather with wind chill factor of at least another 10°, he sits on the snow and fumbles around with my crampon track, snow blowing all over his bare hands. Somehow, he managed to get it back together, shoved his hands back into mittens while Natalia helped strap it back on my foot. Summit bid saved! I was very thankful for my guides, and for my team. It was a good lesson for me – until then, I found myself annoyed at the slower-than-desired pace, at the poor technique of some (one woman had a horrible gait, and didn’t properly use her crampons, resulting in sliding back every third step – losing ground and screwing up the rhythm). After this experience, however, I learned to appreciate the benefits of the group and be more tolerant of the disadvantages. And did I mention it was cold? 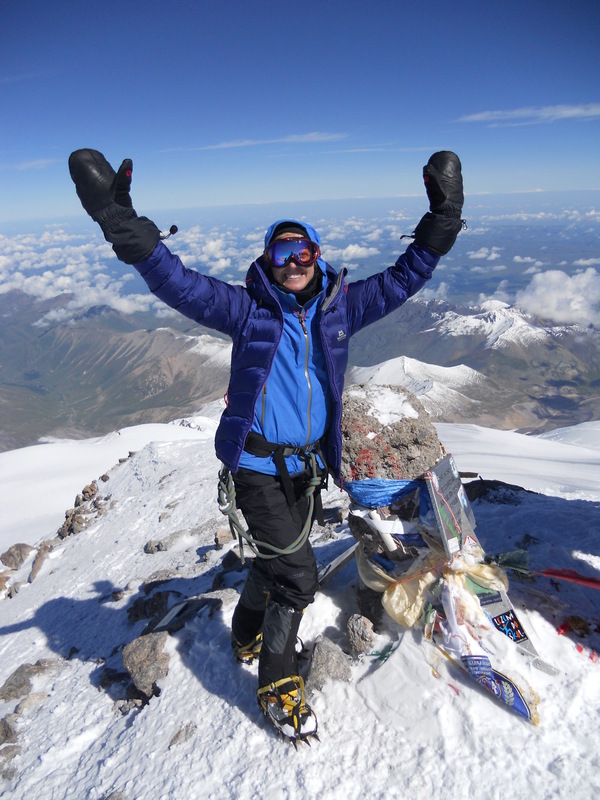 At around 8:00, Vladimir sat us down for a “long break” at the saddle, still in the shadow of the eastern peak. I was worried I would have to turn back, my toes were so cold. So I spent the break swinging my legs & stomping my feet, trying to keep the blood moving even while we were at a standstill. Shortly after we got going again, we reached the sun and my saving grace. The next slope was again a steep one. We strapped our poles to our packs and used our ice axe to climb. The rhythm is: axe, step, step. Axe, step, step. The snow was deep and it was slow, strenuous going. About 150-200m above the saddle, we reached the fixed ropes, which run along the last vertical 75-100m, and are around 200m long. This i s a steep, exposed area often buffeted by strong winds – hence the fixed lines. We were lucky on our summit day; the wind died down shortly before we reached the saddle, and so the fixed lines were less crucial than might otherwise be the case. Nevertheless, we hooked in and moved slowly along the ropes towards the plateau. At one of the anchors, I struggled to get my carabiner open. It had dragged in the snow and was now frozen shut. As first in our group, I felt bad slowing things down while I warmed it in my hands to thaw the snow and ice blocking the closure. 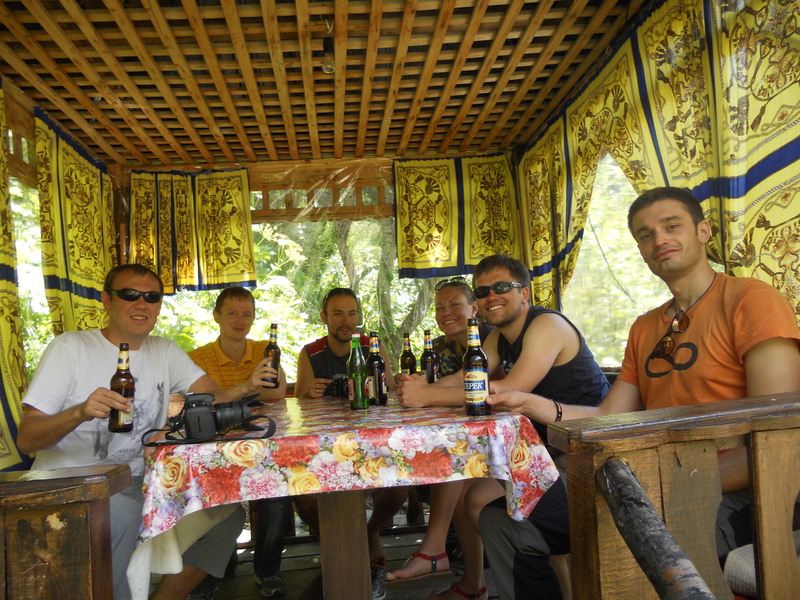 Until Sergey, behind me, let out a big sigh and said, “ahhhh. Jaimi. Take your time. I like the rest.” Finally thawed, I hooked around the anchor and continued up. 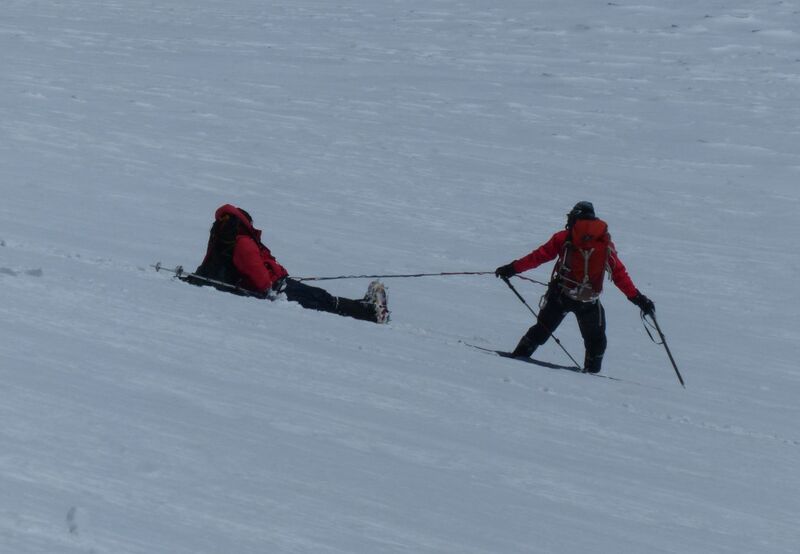 At the plateau, we unhooked and collapsed on the ground for a short rest. It all may sound rather innocuous when I talk about ascending 100 or 200m. Clearly in regular circumstances, this is a rather trivial amount. On a normal hiking day in the mountains, you can generally expect to average 300-400m an hour without rushing. Here on Elbrus, given the altitude and the conditions, it will easily take twice as long and cost twice as much energy (maybe even more). 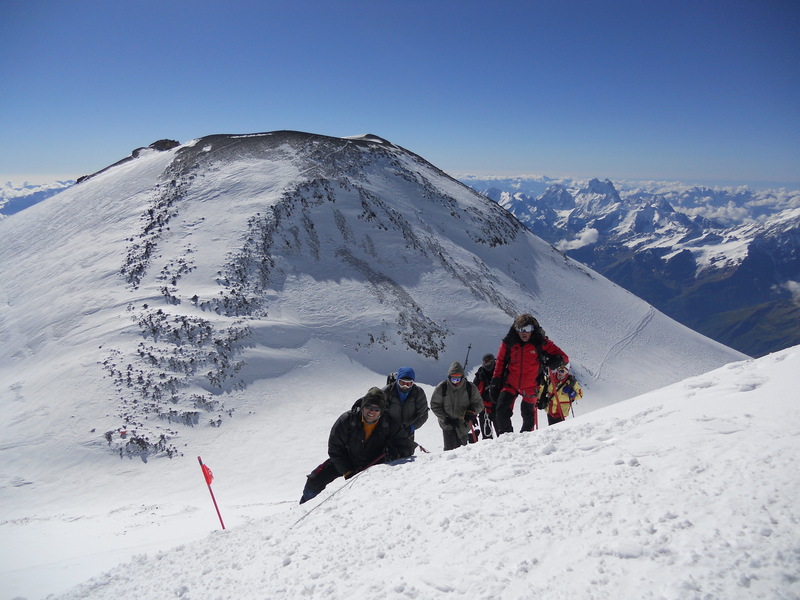 Towards the top of Elbrus, above 5300m, each 100m takes about 40 min at an average pace. Some people need an hour, some longer. So it’s slow going and extremely taxing. Sitting on the saddle, sooner rather than later, the excitement of being so close to the summit overtook the need for rest, and we were back on our feet. We shot a few photos and had something to drink, which was badly needed, with everyone well on the way towards dehydration by now. 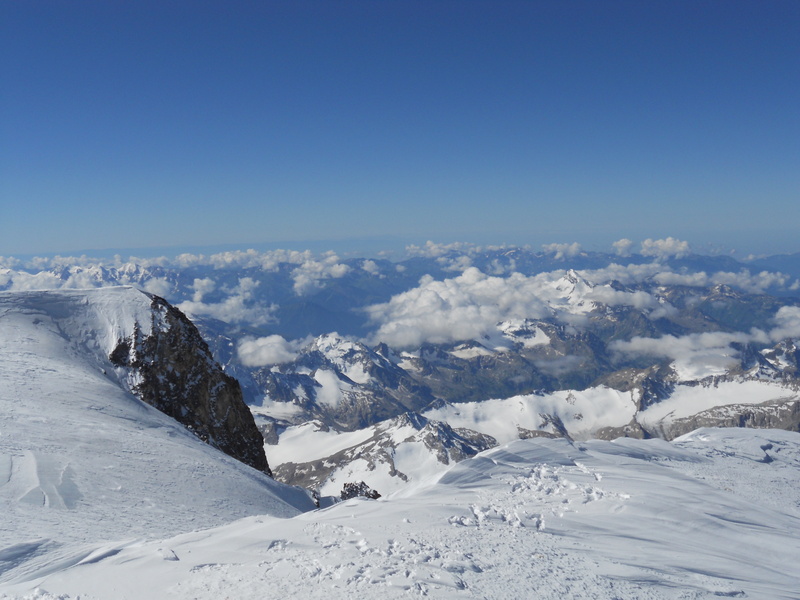 Dehydration is a normal and ever-present danger in high-altitude mountaineering. With the thin air, cold, exercise and sweating, the body really needs at least 4L of liquid a day. At least. 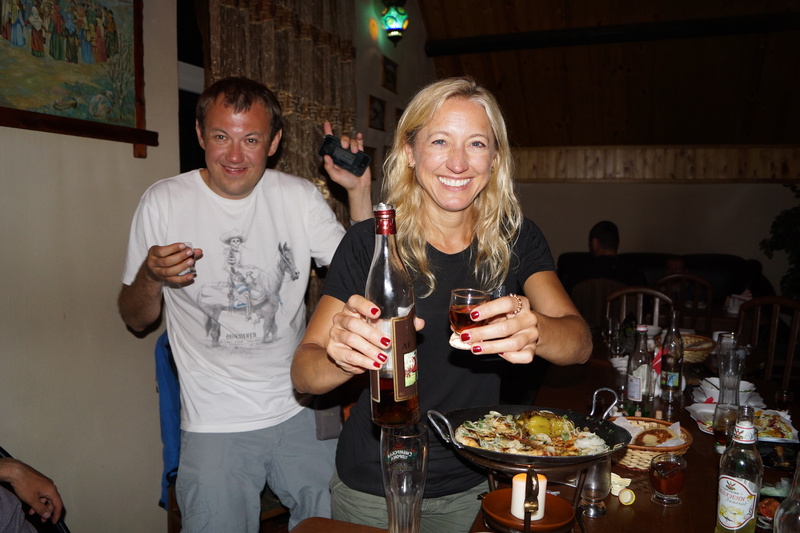 Especially during a summit bid, with the long trek and higher altitudes, your need for liquid increases conversely to your desire – or ability – to consume it. I was so focused on getting the job done, and so unwilling to stop and fumble around in my pack for a bottle, that drinking simply became a lower priority. And travelling light, I only brought 1.5L with my anyway. Having finally consumed something to drink and re-stowed everything back in my pack, I headed up the final stretch. For the first 10-20m, the peak isn’t visible. Then I went over a small rise: and there it was, before and above me. It seemed impossibly far away. How can I still have to walk so much to get there? A long, gently sloping track led across the top of the mountain, ending in a steep 10m climb to the very summit. I wanted to run, to get there, but could only plod along – slow step, step, step, slow step. People already heading down again shouted congratulations, as we finished these last, grueling meters; broad grins on their faces, knowing how much effort we were still exerting and glad to have it behind them. Slow step, step, breathe, step…. And then – I was there!!! On top of Mt. 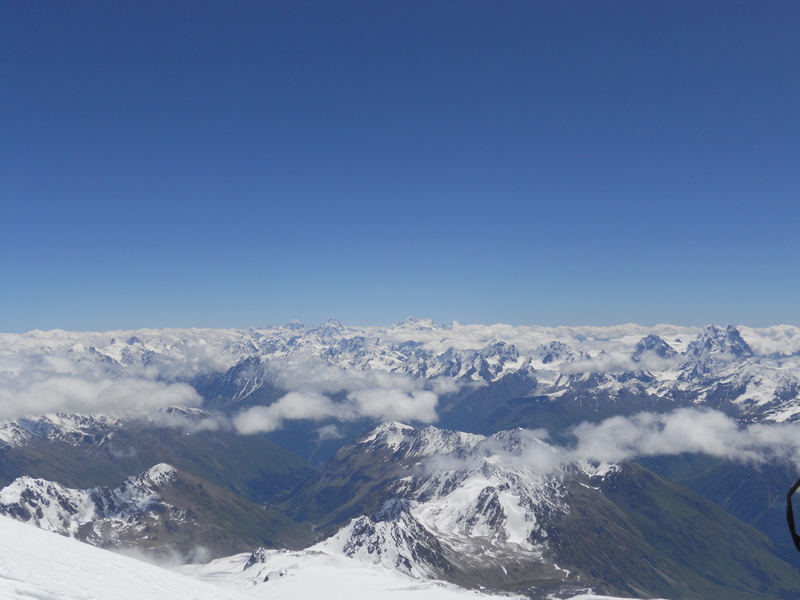 Elbrus, at 5642m and the highest point in Europe, looking down at the Caucasus Mountains of Russia, but with the border to Georgia only a few kilometers further south. We were shouting, hugging, grabbing each team member as they came over the lip of the peak, high-fives all around. What a feeling! Individual pictures, group pictures, the whole team together. Marveling at the view, and the accomplishment of having made it, it’s easy in the euphoria to forget that the job is only half done – you still have to get safely down again. Which is no easy task; especially for those who have exerted almost everything they have just to reach the summit. One of our team members was close to collapse, continually dropping to the ground and unable to walk a straight line. The woman with the poor mountaineering skills was stumbling around looking drunk, and more than once, I thought she was going to just pitch over the side and take the fast – falling – route down from the summit. And all of us had altitude headaches of varying degrees by now; every minute we stayed up high would make them worse. Having learned my lesson at Kili, I was toting ibuprofen and managed to control my headache, although not completely suppress it. So, after one last look at the mountains around (which look tiny from up here – even though they are huge mountains in their own right, many well over 4000m and a number over 5000m! ), down we went. The walk to the plateau was easy enough, this time being the person encouraging and congratulating the folks still heading up. After the plateau, it got tricky. The fixed lines were full of people headed up, so we decided on an ice axe descent towards the north, looping back around to the saddle. 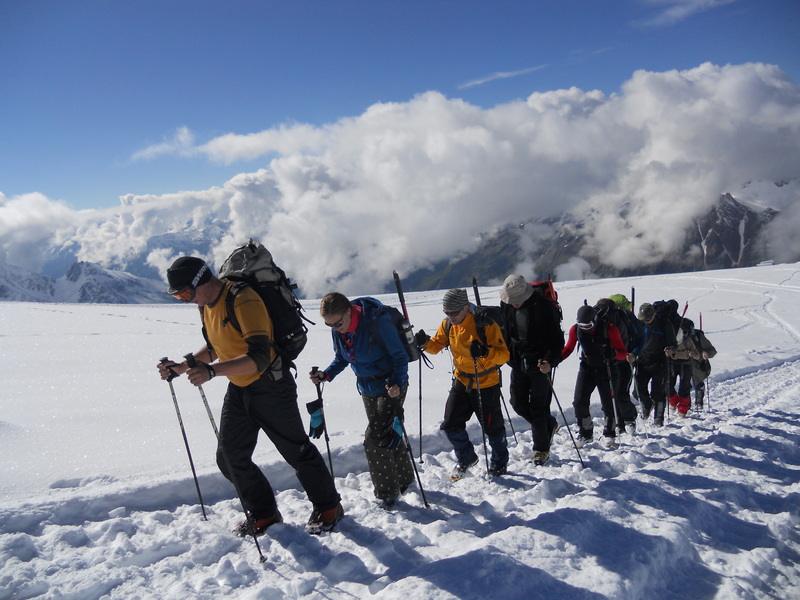 This was around a 45° slope, requiring us to descend backwards – ice axe, crampon, crampon. Ice axe, crampon, crampon. Already after only 20m of this, I felt about to collapse. The physical exertion was enormous, and compounded by the fear of losing my footing and careening down the slope, it required every ounce of strength. I really did not want to have to perform a real-life ice axe arrest . We had practiced them the day before, and first of all, it isn’t easy. And secondly, it can take a long, scary time to actually come to a stop. With breathing breaks every 10-15m, I finally got half way down the slope to where Vladimir was waiting. He then sent us on a north-westerly course, slanting down and around to the saddle. Less steep now, we could walk forward (ice axe, step, step), but it was still exhausting. We were more than ready for a break when we got there! Once there, I also decided to try to eat something to help with my energy levels. So far, I had been avoiding eating all morning, for fear it would just make me sick. I also now could attend to another pressing matter – I had needed to pee for about 3 hours, which is a really big issue for a woman wearing 4 layers and a climbing harness. 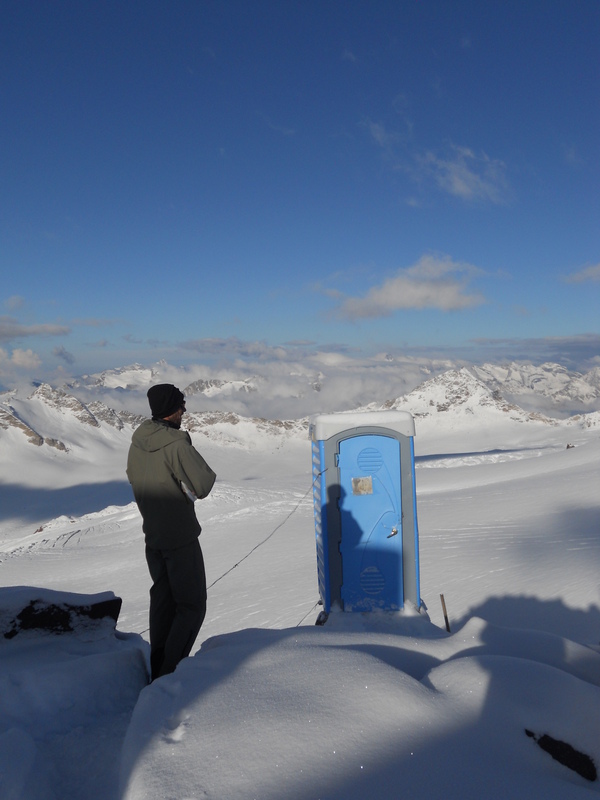 A couple of days ago, on our acclimatization hike, a young woman in the group asked me, “ummm…how do you go to the toilet up here if you need to?” My answer – you just go. If you can find a rock or a small rise to go behind: great. If not – oh well. Up here, I’ve come to the conclusion, it’s just not worth worrying too much about. So now, during our break, I found a spot only visible to people going up or coming down, not those sitting at a break. I figured everyone on the move was too focused on themselves to care anything at all about my bare bum. Loosened my harness and wiggled free from my 4 layers – and what a relief! I had been worrying about the long, jarring steps of the lower descent, but now I was ready to handle them. Everyone had to make the trip from the saddle down to 5000m – a difficult trek for everyone, close to unmanageable for some. I’m not sure exactly how the one guy in our group got down. Reviewing the photos, someone was roped up needing help; could have been him, although I’m not sure who it was. 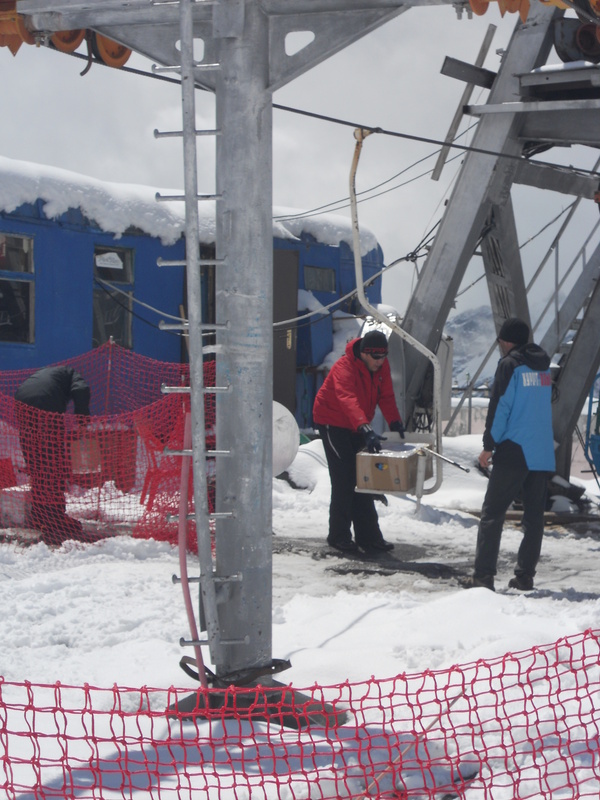 Anyway, at 5000m, enterprising Russian snowmobile and snow cat drivers were offering rides down – for a hefty fee. Two or three of our group took snowmobiles, and the second group of our company (who rode the snow cat to 5000m in the morning) also all rode down. The rest of us decided to trek it out. After all, we were still able to walk and are here for mountaineering, now snow cat touring. The result: a very long, 1200 vertical meters of big, sliding, heel-first steps into the snow. Fun at first, this quickly becomes hard on the knees and quite tiring. Two hours later and 11 hours after our first steps up the mountain, we arrived back at camp with shouts, hugs, renditions of “we are the champions” and general overjoy as we removed the heavy crampons and boots. Rather than have lunch, we opted for a return to the hut. A liter of water later (to help offset the dehydration), we took quick “show showers” to help neutralize the sweat and body odor, put on dry clothes and climbed into sleeping bags for a much-needed rest. an incredible experience with us. 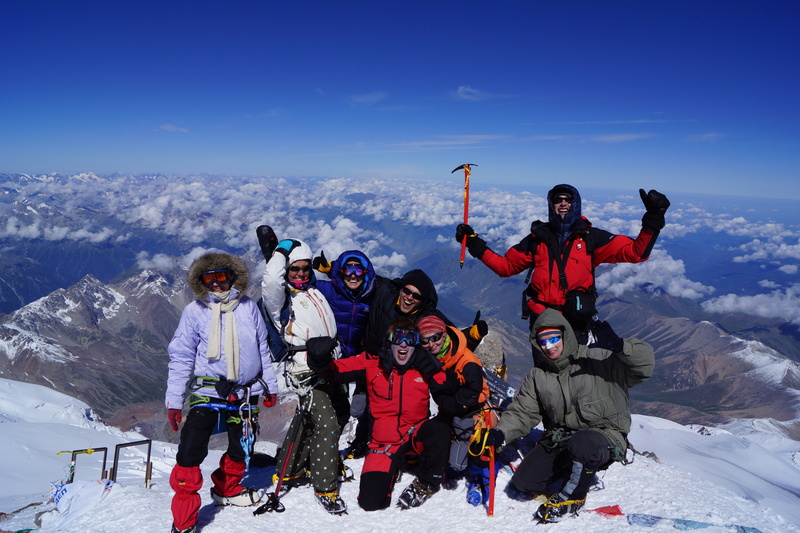 the after the summit – feeling joyous! 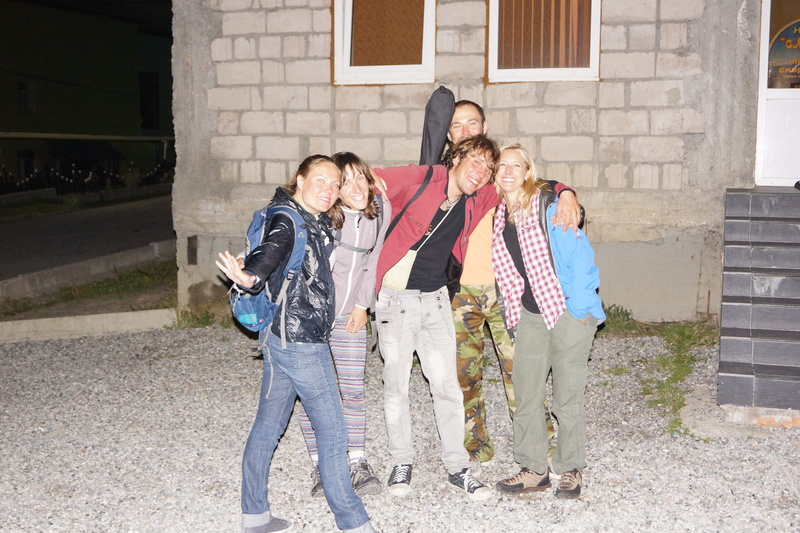 Jaimi, thanks a lot for this blog, It reminds me of one of the greatest mountain experience i had so far. I real enjoyed reading it! Would be great to meet you, Martin and Sergej ones again somewhere in nowhere about 5000 m.
It was a great experience, and you guys were such a big part of it for me. Yes, we really should do a reunion mountain!